28 Day Detox and Shred. 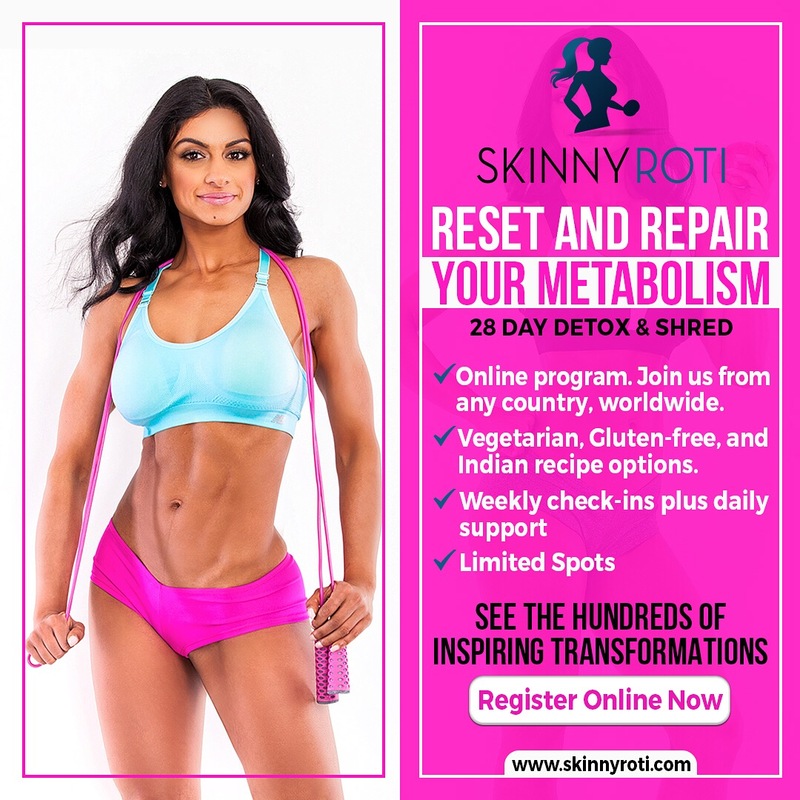 | http://skinnyroti.com | Get Skinny with Me! Home / Ebook / 28 Day Detox and Shred. Begins April 15th , 2019. Limited. This is not a diet. This is me teaching you how to eat everything you already enjoy. It’s me helping you to cook it healthy yet flavorful enough not to feel deprived. This will not feel restricted so you will never yo-yo diet again once you are given the tools for success. I truly believe that you need to first learn that your body is made in the kitchen. You will be amazed how much your body will transform by just changing your eating habits. What can you expect besides fat loss?? Get your body into fat burning mode by letting me help you to speed up your metabolism again. Your metabolism will hold the key for this to become a sustainable lifestyle change. How about healthier? No more PCOS or cholesterol, or diabetes or digestive issues. Your health, and all diseases are a direct result of your gut health which is determined by what you eat. How about just being a healthier you? You are worth a disease free life! Get processed foods out of your system. CHECK OUT the transformations page to see program success stories. You’re next!! 44 reviews for 28 Day Detox and Shred. I highly recommend this program for anyone who is struggling with not just losing weight but becoming healthier in general. This program helped me realize the importance of meal prepping and changed my every day routine permanently. I learned how to make healthier choices with what I eat and the weekly check-ins with Harj are also a great motivation as you look forward to working hard to achieve a better end result. This shred had me feeling great and seemed to be the only thing that has worked for me for fast weight loss results as well. The 28 day shred is a great place to start for anyone who doesn’t know where to begin making a change in their lifestyle. Thank you Harj! This 28 day program is awesome! If your wanting to make a change in your life for good this is the program for you, its easy to follow, with alot of food variety. I was always full, no sugar cravings and most of all had lots of energy and strength to do things with family. Thanks Harj for your guidance. I had a great success with this program. The weekly check in with Harj helped keep me in check. Lots of great options for every diet and I would recommend this to any individual wanting to make a change! I highly recommend this program for anyone who is ready to make a change but don’t know how to do it. This 28 day meal plan was exactly what I needed! It was easy to follow, the food choices were varied and the recipes were easy to follow and delicious. I am estatic with my results overall I lost 11.5 pounds, 4 inches from my waist and 6 inches from my hips. This is a lifestyle change for me and I am grateful to Harj for her guidance!! I can’t thank Harj enough! It had been roughly 5-6 years since I had my period and doctors were not able to figure out why. The first week on this shred I noticed an incredible difference in my mood and energy and the best part is I got my period for the first time in the longest time. Before starting this shred I had tried and failed many diets but with this one it didn’t feel like a diet. I started making healthier choices and drinking much more water than I had before. If you think that you’ve tried everything out there and it just hasn’t worked give this a try and it will change your life! Thank you so much Harj!! Harj has an amazing program, this 28 day shred it is LIFE CHANGING. I never thought it would have this big of an impact on me and my day to day. Her program has taught me how to eat clean and healthy without feeling deprived. I am still able to eat from all the food groups which is awesome, because like most people I enjoy my carbs. Now I am eating all the right things and feeling satisfied and as a result I have lost a total of 13 lbs and counting. Instead of going out to eat all the time or hitting up the local drive thru I am hitting up Reflex for goodies or looking for other alternatives to add to my daily routine to spice things up. This program is literally life altering all you have to do is put in the work, all the info and support you need, Harj gives you. Definitely recommend this program to anyone looking to make a lifestyle change. It has been a great kick start program for me. I lost all that extra water weight and don’t experience any bloating anymore. I can see some changes in my body and I feel energetic. I have learned how not to starve in order to lose weight , rather make healthy choices and eat as much as you want. This is something I can do for the rest of my life and make my future kids follow through. You have been so motivating at every step of the way! So, I would like to thank you for all your help and guidance. Such an amazing kickstart to my weight loss journey! The biggest lesson I learned throughout my 28 day shred was how to eat and when to eat. By following the meal plans, I realized how much of my kids leftovers I was eating, or joining in on a chip here and there with them. I felt full of energy throughout my days, and I am still continuing with the meals. This was NOT a diet my no means, but a healthy lifestyle change. Harj was such a support through all of this, and very motivating throughout the whole process. The 28 day shred program was amazing!!! It is not a diet its a lifestyle change and is something that I can keep up and continue doing for the rest of my life. At first I was always under the impression that the less you ate the more weight you lose, with this program I learnt that eating small portioned meals every 2-3 hours increases your metabolism which is key in weight loss. Harj was amazing in answering all my questions and helping me through this whole process, thank you soo much for all your help and support. I was a part of the July 2017 shred and I have to say this program is different than anything else I have tried. It was a great help having Harj always available to ask questions and she sent daily motivation e-mails. Since I joined the shred, I have changed the way I eat but still manage to enjoy all my meals! But most importantly, I learned that I didn’t have to cut anything out of my diet (including fruits) to lose weight and be healthy. The 28 day detox and shred online program was really helpful. Harj has organized it very well and explains when to take supplements (ex. post meal one/before bedtime etc) . There are recipes, grocery lists and various substitutes also given. Overall a very good program! I recommend this to anyone struggling to get started. I was stuck and the 28 day shred changed my life for the good! It was so easy and stress free to follow. At first it felt like a lot of food but now I can’t wait until the next meal! The plan truly taught me about how often I should be eating and controlling how much I should be eating. The food is so tasty too! Harj is truly dedicated and amazing at coaching you through every step of the way. So thankful for her help and motivation. I did the detox in January and I’m still following it and my weight has stayed off. This is a great way to kick start weight loss journey. In the beginning it felt like too much food but toward the end of the 28 days I was looking forward to the next meal. It’s easy to follow and being a vegetarian it provided a lot of protein alternatives, which has always been a challenge for me. I think everyone should try this out! Thanks Harj for all your support and tips during and after the challenge. How can I even get started?! I’m so happy with this program! The results were amazing! Food was delicious, it as hard to get use to in the beginning but you get the hang of it. As a mom of two, I don’t think I ever had this much energy or confidence! Harj gave her continuous support through out the program, which was very appreciated. She’s an amazing role model! If anyone has any doubts, just dive right in! I took this challenge , but just like any other challenge I was very sceptical and nervous. I was afraid of being hungry and not having enough food selection choices. Upon receiving the package I was amazed at the food options, there were numerous!! Me to stick through with even one year later ! Anyone looking for something they can stick with, and see amazing results I strongly recommemd this !!! I have been following Harj and felt comfortable to join this 28 day shred and detox program in October 2017. This is the first time I have joined a program of such. I reaped many benefits from eating a balanced healthy meal, advice and tips, and support throughout the program. To this day I continue on my goals to lead a healthy lifestyle. Thanks Hard for this wonderful program that actually works. This plan and Harj’zlsweekly guidance was an amazing. I had a alot digestion issues and was always bloated. After doing this plan, I never had any bloating issues. I loved the vegetarian options. This program have given me alot confidence and I feel like I can do more things. My family saw huge changes in my weight and emotional level. I would recommend everyone to take Harj’s guidance and her amazing diet plans. Thank you so much for changing my life. I had not seen the scale budge in months and within 3-3.5 weeks I had dropped 7 lbs…without exercising. I am excited to see how continuing to follow the program and working out will work together. I picked the 6 easiest meals for me and had those for the four weeks, just made it easy for me. This program just motivates you to get going when you see such a difference so quickly! Joined the plan about a year ago and still following the diet plan and her guidelines. she is not stretching it when she says these are sustainable long term lifestyle chnages. This program is honestly so great for people who struggle with their meals. I have always struggled to make my meals enjoyable therefore my diets have always been unsuccessful because I just give up. There were so many options in this program that if I was craving anything there were options that could satisfy them which was big bonus for me. It was hard at first cause I usually don’t cook but after the first week it was much better cause I was learning so much. Also the support and tips from Harj were so helpful. With my meals and working out I dropped 15lbs in 28 days and a total of over 10 inches! I will definitely be continuing with this plan!! Highly recommend!! This program is a great starting point to give yourself a push to a healthy lifestyle. The best part is that you are given a meal plan with plenty of options to make changes if necessary. I did the shred in fall and, although I didn’t see the results most people saw, I was still happy with what i did achieve. I found that following the meal always left me feeling better and i have more or less stuck to it. I absolutely loved this program, it taught me so much about my body but also how important nutrition is for the body inside and out. I felt so good by the end of the 28 days. I had more energy, happier, my skin looked amazing, hormones were balanced and a lot of other issues I had were basically gone. The best part about this program is that it teaches you how to live a healthy , balanced,sustainable lifestyle. Harj Is with you every step of the way and makes sure the program is tailored for every individual.I would recommend this program to everyone. This has been a life changing plan for me. It has educated me about portioncontrol and eating clean. Harj is so inspiring and has made this program so easy to follow. Thank you! Looking forward to starting the 28 days to tight and toned! The 28 Day Detox and Shred is great for people who aren’t sure where to start or how to start eating healthy foods. I learned a lot from this plan including that I was not eating nearly enough food, I was not eating often enough and I needed way more protein. If you are looking to start new and improved eating habits, this plan is for you! This was exactly what I needed to boost my fitness goals to the next level. Easy to follow, great recipes, weekly support from Harj and it definitely becomes a lifestyle! Hubby did it with me as well and although the tends to fall off a couple of times a week I still meal prep and follow the plan months after beginning it. It’s a great program for everyone whether they are beginning their fitness journey or getting it to the next level. She is not selling a fad diet plan, she is teaching how to live your life sustainably and live a healthy life. Her plan will Kickstart your journey to a new lifestyle. It’s a full proof and easy to follow plan that will change your life. One of it’s kind in the market, absolutely love Harj for sharing her knowledge. This detox is great!!! You get a variety of foood. Wheter you are someone who don’t mind eating the same food for 5 days straight or you’re someone whp likes variety, this program is for you!! Thank yiu Harj for showing me that its possible to eat better and enjoying your meal at the same time. P.S./ her chilli is to die for!! After 28 days of being loyal to the various options on the meal plan and actually feeling leaner by the day, it has been an effortless transition into my lifestyle to just continue eating this way. And not because I feel I have to, but because I want to. I love that I know what I am going to eat ahead of time instead of throwing something together. However, this process wasn’t just about food, it was a well-thought out education on many different levels that Harj personally shared with me. The best way to be your best… is really to learn from the best! This program is great and honestly life changing. Being a guy you would think you may not get enough food!! This plan allows you to eat your favourite foods and lots of it. For all men that may be discouraged, DONT BE!! Harj Is is very helpful and knowledgeable for all men reading this sign up and transform !! The 28 day shred is a lifestyle change that is easy to follow with great results. The first few days are challenging, but after that I felt energetic, mental clarity, slept better & you loose inches!!! This is the first program I have been on that I did not feel deprived. I can’t wait to reach my goal! This program is incredible. I am someone who works out regularly, 4-5x a week but I just was not seeing the results I wanted. This program truly teaches you the importance of eating, and that you can still enjoy the foods you love and lose weight and get toned. I absolutely recommend this program to anybody! This plan was one of the best things my fiancé and I have ever done. It was complete lifestyle change. We had so much energy and we were eating more than you can imagine! Harj, is one of the best and most knowledgeable coaches out there she provides lots of information and is thier to answer all of your question! If you want to see results and live a healthy life style, look no further a join the plan! This program is a MUST for anyone looking to make a lifelong change in their lives. Over time I’ve spend hundreds of dollars doing “fad diets” that I’ve come to realize were so extremely unhealthy for me. I had been a long time admirer or Harj when I decided to join her February shred and in 28 days, she completely changed my life. Since February I’ve lost nearly 50 pounds and countless inches. I’ve gained confidence that I had lost over the years AND I overcame serious health issues such as Hypo-thyroidism and PCOS. Whenever anyone asks me about the program, I have to tell them that you can do just about anything for 28 days, but what you truly gain from this program is invaluable knowledge of how to properly take care of your body and health. SIGN UP RIGHT NOW!!!! This program is the best program I have ever done, I’ve been a yo-yo dieter and never been able to find a happy medium when it comes to weight loss, but Harj’s program is completely different… it’s a lifestyle change it allows me to actually eat food and not be cranky and hungry all the time, the meals are delicious and even my kids enjoy them. I wake up with so much energy and I am so happy with the outcome I have continued the program and couldn’t be happier. This is definitely the best decision I have ever made. Aw, thank you so much. So nice to hear the entire family is now enjoying healthy nutritious meals. Keep it up and the kids will always have this ingrained in them as the norm for eating. So great for their future and yours!! This plan is so amazing. It allowed me to eat so much, and I would actually be too full to eat my last couple meals of the day. I have so much energy to wake up early and still be energetic after my evening classes. Harj sends emails almost every day and it made me feel on track because of that. Thanks Rhea. You did great and yes, lots of food because we all love to eat, and should live life enjoying our food. Thank you for your support! !